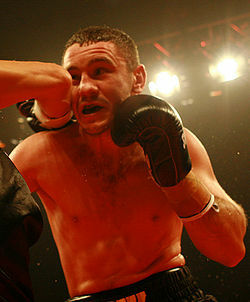 The Ukrainian-born Viktor ‘The Hurricane’ Chernous is the current Australian welterweight champion. On the 4th March 2011 Victor takes on the New Zealand champion Steve Heremai at Flemington Racecourse, Melbourne. The fight will be broadcast on Foxtel. Viktor’s trainer, Ivan Bukavina, thinks that his opponent will be the hardest he has faced to-date. “He is tough and a big puncher, but Viktor will win” says Ivan Bukavina, who would not have matched him up if he didn’t believe that Viktor would win. Viktor, who currently resides in New South Wales, Australia, was born in 1984 in Vinnytsia, Ukraine. He recently returned there to get married. Before turning professional, Viktor was in the top ten ‘Sportsmen of the Year’ with 170 amateur fights. He represented Ukraine at the 2002 World Cup. He has had 12 professional fights in Australia, winning 11 and losing just once. He has won three titles – 2 state and one Australian title. Viktor is a future world champion prospect. The fight on the 4th March in Melbourne is being promoted by the former World Title holder, Barry Michael. Come and support Viktor in his boxing aspirations!